11 - What’s On the November 4 Ballot? 17 - Want to Keep Up With What’s Going on in Madison or Fitchburg Government? 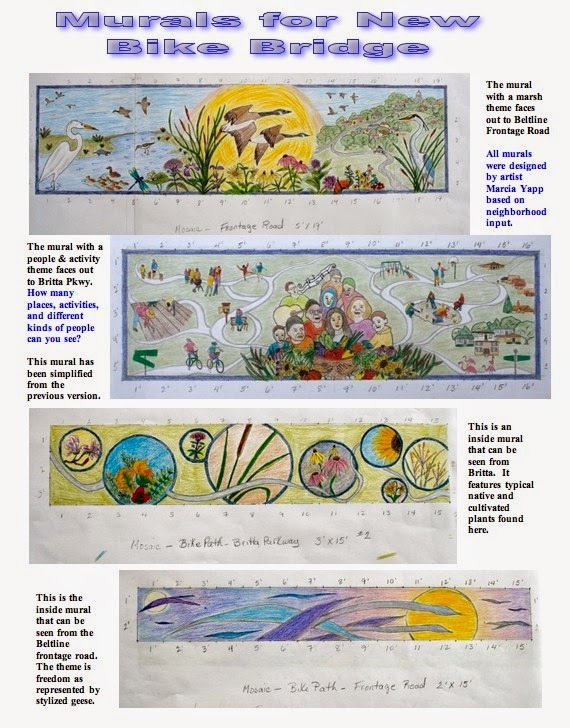 It’s the last hurrah for the Marlborough Community Garden mosaic project. The project was completed last month, and now it’s time for a little celebration. How long will it take? Not too long. A few minutes of live music by two members of Dark of the Moon Contra-Band until people have gathered. Recognition of the organizations that helped get the project going. Recognition of the individuals who actually executed the project. A few facts about the project. 15 or 20 minutes total, probably. Afterward, the gardeners will go on with their closing day work for the garden. We are hoping for good weather, but in case it would be raining, we’ll do this in the Marlborough Park shelter. If you participated in this project in any way, please come and take your bow. Contributors include those who trained for the workshops, mowed the grass, provided child care, made a mosaic on a stepping stone or helped someone else do it, mortared the glass to the stones, hauled the stones to storage or out of storage, grouted stones or polished the grout off the glass, helped set the numbered stones in the ground, or worked on getting the “Marlborough Community Garden” sign in the ground. This is well over 100 people since 40 came to the first workshop, 50 to the second, 30 to the grouting workshop, 30 participated in setting the numbered stones, and 10 completed the project by installing the garden sign. (Some volunteers participated in all the activities!) Volunteers ranged from age 6 through 80+. 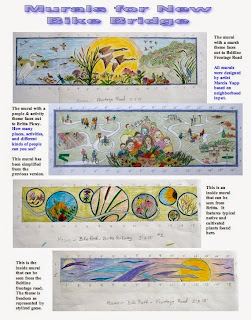 This project was funded in part by the Madison Arts Commission, with additional funding by the Wisconsin Arts Board and Marlborough Community Garden. The Fall Shred Day Event will be Saturday October 25 from 7:30 - 10:30 behind Oak Bank (5951 McKee Rd) at the corner of Executive & Marketplace Drives. No more then 5 boxes of confidential paper documents can be shredded and recycled for FREE. The food was plentiful and tasty, photos from the neighborhood cycled on the screen throughout the meeting, people got a chance to visit and then talk about their concerns, and finally the DMNA Council for 2014/15 was chosen. Another year, another year of life for the Dunn’s Marsh Neighborhood Association. For attending: 29 people were signed in. For their service as DMNA Council Members October 2013-2014 and attendance at this meeting: Mary Mullen, President (Marlborough rep); Tony Williams, Vice President (Crawford rep); Thea Bach, Secretary (Marlborough rep); Yannette Cole, Treasurer (Marlborough rep); Rachel Potter (Belmar rep), Karen Walters (Belmar rep), Dorothy Krause (Belmar rep), Heidi Figueroa (Marlborough rep), Denise Williams (Crawford rep). Lucy Blue was out of town. For volunteers who agreed to continue on the DMNA Council: Yannette Cole, Heidi Figueroa, Thea Bach, and Mary Mullen, representing Marlborough; Tony Williams, Denise Williams, and Lucy Blue, representing Crawford: Rachel Potter and Karen Williams, representing Belmar. For a new Council member: Ann Marie Hughes, representing Marlborough. We are holding open a position for an Allied representative and also have 2 positions open for anyone in the neighborhood regardless of where they live. If you are interested in serving , contact President Mary Mullen (See masthead) and come to the November 13 Neighborhood Council meeting (See calendar). 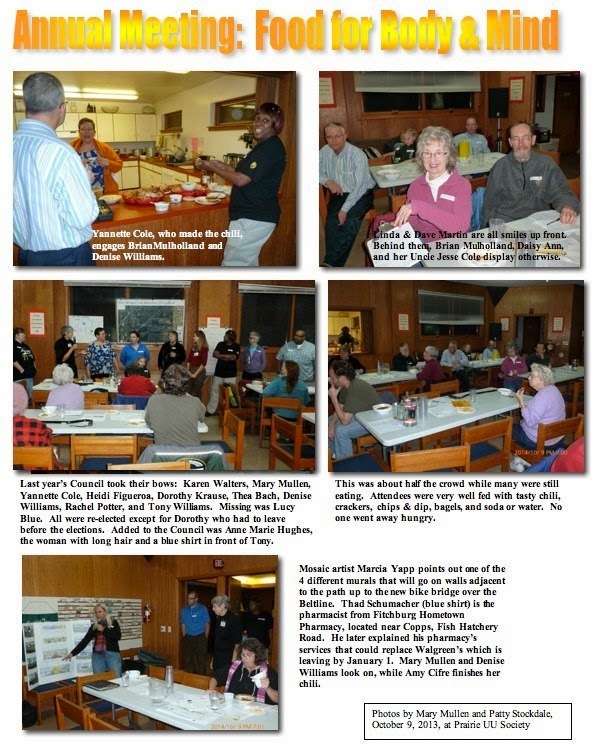 The Dunn’s Marsh Neighborhood Association is an active organizaiton. Each year, we present a list of our accomplishments at the annual meeting, which this year was held on October 9, 2014. Read the highlights of the DMNA activities below. 1. Applied for and got a grant from the Madison Arts Commission for a mosaic stepping stone project in the Marlborough Park Community Garden. 60 stepping stones were made. Many people (~ 40, 50, 30) attended the 3 workshops to make and grout the mosaics on 7/ 17, 7/19, & 7/24; 30 helped install the 32 numbered mosaics on 8/23; and 10 helped install the 26 mosaics that read “Marlborough Community Garden” on 9/20. Recognition eeremony to celebrate completion will be held on 10/25/14 at the garden sign starting at 10 a.m. sharp. 4. Sponsored many special presentations/events in & for the neighborhood. 7. 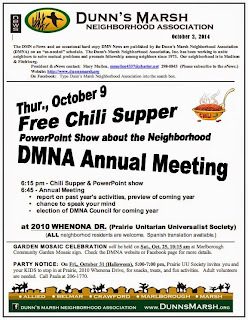 DMNA Neighborhood Council met 11 times and Council members kept abreast of developments, participated in meetings or events, and contacted city staff about neighborhood issues. The peak of fall colors has passed, but we can still revel in that amazing show of the past few weeks. Don’t pass up the collage of photos from Dawley Park taken just a few days ago. They’ll warm your heart. 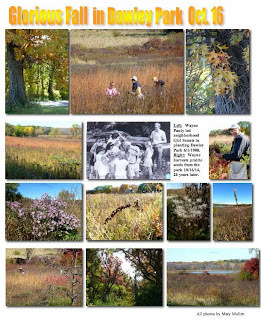 What a treat to meet up with Dane County Naturalist Wayne Pauly who was leading a group of volunteers on October 16 picking prairie seeds in the park. On June 1, 1988, more than 26 years ago, Wayne met with a Dunn’s Marsh Neighborhood troop of Girl Scouts to plant part of the Dawley prairie. 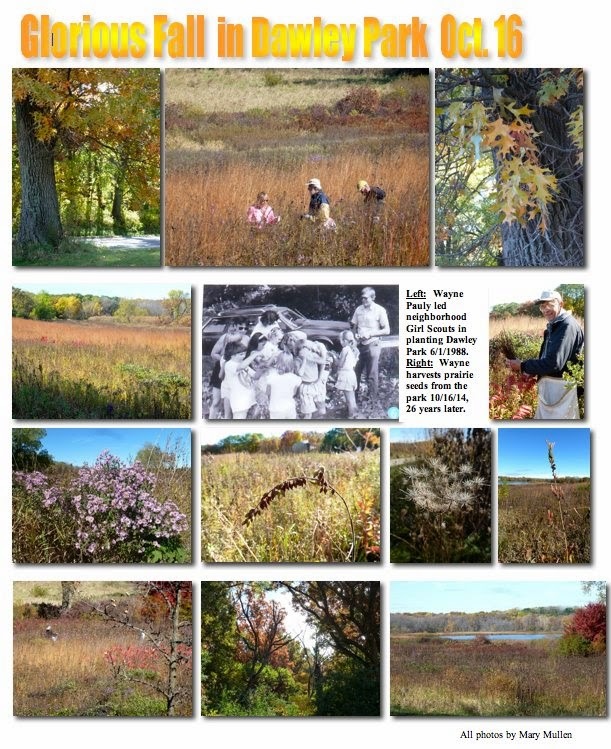 The photo collage shows how that prairie has matured and become one of our neighborhood’s finest assest. The park, south of Dunn’s Marsh and easily accessible from Seminole Highway by bike or car, has a lot to offer at any season, inclulding super views of Dunn’s Marsh. Come join the Dane County Bar Association and the Boys and Girls Club of Dane County and help plant an urban orchard. Thanks to a generous grant from the State Bar of Wisconsin, we will spend the morning learning how to plant and care for pear and apple trees, getting to know fellow attorneys, paralegals and community members, making new friends, and having a good time doing it. We are excited to welcome professional arborist and national tree-climbing champion, Colin Bugg, who will be showing us how to climb trees, tie knots, and what it takes to make a living climbing trees. Madison’s Urban Tree Alliance will also be on hand to discuss their initiative to plant 500 trees by June 2015 on private property in low-income, low-canopy neighborhoods at no charge to residents. We will be providing seedling for participants and the Alliance hopes to identify some new planting areas with the help of participants. Please pass the word on to other tree lovers and community minded folk as this will be a fun event where all are welcome to join in. What to bring: Wear gardening/work clothes, work gloves, warm layers, and jackets. City of Fitchburg will provide all the tools needed for planting. We will be providing bagels, donuts, fruit, coffee, and hot apple cider! RSVP: Please send RSVPs to adam@herricklaw.net <mailto:adam@herricklaw.net> . Spouses, children, friends, colleagues and late arrivals welcome. All of those who RSVP will be sent an event reminder as the planting date approaches. If you have any additional questions or concerns, please do not hesitate to contact Adam Woodford anytime at adam@herricklaw.net <mailto:adam@herricklaw.net> . The Urban Tree Alliance, a nonprofit organization based in Madison, is offering one or two free trees to residents in eleven neighborhoods across Madison. All residents of the Allied Dunn’s Marsh, Berkley Oaks, Bram’s Addition, Burr Oaks, Capitol View, Carpenter-Ridgeway, Eken Park, Emerson East, Hawthorne, Whitetail Ridge, and Worthington Park neighborhoods are eligible to receive up to two free trees. The goal of the Madison Canopy Project is to plant five hundred trees in underserved and low-canopy neighborhoods within the Madison Urban Area by the spring of 2015. Our hope is to strengthen the Madison urban forest by increasing species diversity and helping the public learn how to care for trees. Urban forests provide many benefits to city dwellers. Trees remove air pollutants, lessen home heating and cooling costs, increase property values, provide habitat for wildlife, absorb noise, capture stormwater, and even reduce stress and speed healing in hospital patients. Research has demonstrated that low income urban areas typically have less canopy cover (fewer trees) than high income areas, and Madison is no exception. With the help of volunteers, the Urban Tree Alliance planted forty-two trees in June, and we will continue to plant additional trees each month through October. Residents who accept a free tree can plant it themselves, have a group of volunteers led by UTA staff plant the tree for them, or even volunteer to join us in planting trees in their neighborhood. An important aim of the Madison Canopy Project is to increase the species diversity of Madison’s urban forest. Diversity makes urban forests more resilient and lessens the overall damage caused by diseases and pests such as the emerald ash borer. 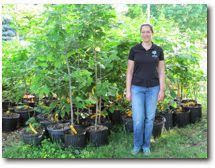 For this reason, UTA is planting species that are less commonly found in Madison, such as the burr oak, chinquapin oak, musclewood, serviceberry, Illinois pecan, catalpa, and Kentucky coffee tree. Anyone who lives in one of the eleven neighborhoods we mentioned can request up to two free trees. Maps of neighborhood boundaries are available on the UTA website at http://www.urbantreealliance.org/resources/madison-canopy-project/. Residents should also have enough space on their property for a new tree to spread out and fully develop. This project is supported in part by funding from a Wisconsin DNR Urban Forestry Grant and a donation from Madison Gas and Electric..
Do you have kids in college or otherwise out of town who are registered to vote at home? Send them a link to the request for an absentee ballot, and keep "reminding" them to get one, and then vote! Do you know that a friend or neighbor will be out of town on November 4? Remind them that they can vote early at their city clerk's office for two weeks before the election (but not the weekend before). Did your brother move to a new home in Wisconsin but hasn't had time to register to vote? Tell him he can register at the polls, or vote at his previous polling place. Most of all, engage people in conversations about the election. Surprisingly large numbers of voters forget about mid-term elections. Your personal contacts are the most effective way to get out the vote. Every vote counts! Thank you so much for your interest and efforts in this election. It's the work of people like you that will make the difference! The Madison City Clerk’s Office will be open for absentee voting all hours permitted by state law: 8 a.m. to 7 p.m. weekdays, October 20 through October 31. The Clerk’s office in the City-County Building. Voters may visit https://MyVote.wi.gov to check their voter registration, see a sample ballot, check the status of an absentee request, or find their polling place. Photo ID will not be required to vote in the November election. The Fitchburg City Hall will have the following hours for in-person absentee voting. October 20th through October 24th - 8:00 a.m. to 5:00 p.m.
October 27th and 28th - 8:00 a.m. to 6:00 p.m.
October 29th and 30th - 8:00 a.m. to 7:00 p.m.
October 31st - 8:00 a.m. to 5:00 p.m. The United States Supreme Court has reinstated the injunction on Wisconsin's Voter ID law. Photo identification will NOT be required to cast a ballot for the November 4 election. If you requested an absentee ballot and then received a request from the City Clerk's Office for photo ID, please disregard that correspondence. The City Clerk's Office is processing your absentee request today. If you have any questions, please contact the City Clerk's Office at voting@cityofmadison.com or at 266-4601. Our goal is for all eligible voters to be able to cast a ballot and have that ballot counted. Don’t go to the polls on November 4 or to vote absentee before that without knowing what’s on the ballot. Experience at the Madison City Clerk’s Office shows that voters are taking longer than expected to mark their ballots. That may be due to the fact that there’s not only a lengthy list of candidates for state and county offices, but in addition there are 3 referenda. Read about the separate referenda in articles after this one. One place to learn more about the candidates is the Balletopedia website http://ballotpedia.org/Sample_Ballot_Lookup#General_election_sample_ballot_lookup On this site you can see photos of most of the candidates and also look deeper into their background and accomplishments by clicking on the Ballotopedia Profile which is under the photo of the candidate. In cases where the candidate is already an elected official, the profile may refer readers to legislative scorecards put out by various organizations. All of this is very helpful in determining which candidate to vote for. When you get to the sample ballot page, you’ll be asked to put in your street address and zip code. Then, voila! there are the names and photos of the candidates. A listing of the candidates and referenda follows. To see a sample ballot, go to https://wi-fitchburg.civicplus.com/DocumentCenter/View/8906 <file://localhost/DocumentCenter/View/8906> The only difference in a Madison ballot is that in the Legislative category, Madison voters will vote for a District 77 (not District 47) candidate, and the only candidate in that race is Terese Berceau, the incumbent. On the surface this amendment looks logical. While Question 1 supporters argue that the amendment will prohibit politicians from “raiding” the state’s transportation fund, opponents contend that the measure will create budget inflexibility and encourage politicians to raid non-constitutionalized funds, such as education funds. This webpage gives arguments on both sides of the issue. “discussion” from Candidate’s Answers which is put out by the Dane County League of Women Voters. "Should the State of WIsconsin increase the minimum wage to $10.10 per hour?" The Dane County referendum on minimum wage is advisory only. The current state minimum wage is $7.25/hour. Full-time, year round work at the current minimum wage earns a parent with one child less than the federal poverty level. An increase to $10.10/hour would be adequate to bring a parent with two children above the federal poverty level. The nonpartisan Congressional Budget Office suggests that a minimum wage of $10.10/hour could reduce total employment by as much as 500,000 workers nationwide, while it could lift 900,000 families out of poverty and increase the incomes of 16.5 million low-wage workers. The UW–Madison Center on Wisconsin Strategy (COWS) reports that 404,000 Wisconsin workers currently earn less than $10.10/hour, and another 183,000 who earn just over that amount would see increased wages due to a ripple effect. Of the Wisconsin workers who would be affected, 87% are 20 or older and 42% work full-time. COWS estimates that the wage increases would generate 3,800 new jobs in Wisconsin as businesses expand to meet increased consumer demand. "Shall the next Governor and State Legislature accept available federal funds for BadgerCare to ensure that thousands of Wisconsin citizens have access to quality and affordable health coverage?" Candidates’ Answers discusses the BadgerCare referendum as follows. The Dane County referendum on BadgerCare is advisory only. Under the federal Affordable Care Act, the federal government agreed to pay the entire cost of expanding Medicaid (BadgerCare in Wisconsin) to adults under 138% of the federal poverty level (FPL) through 2016. Starting in 2017, the federal government would pay a declining share of the cost, until beginning in 2020 the states would have to pay 10% of the Medicaid cost for the newly eligible population. health insurance through the marketplace. The nonpartisan Legislative Fiscal Bureau (LFB) estimates that if Wisconsin had expanded BadgerCare to adults up to 138% of the FPL, the state would have saved $206 million during the current biennial budget period. The LFB estimates that 87,000 adults would be covered by the expansion. Governor Walker argues that the state cannot rely on the federal government to meet its commitment for 90% funding in the future. Wednesday, November 5, 5:30-7 p.m.
Come experience an evening of familiar American jazz standards, as they were crooned by greats such as Frank Sinatra, Dean Martin, and Tony Bennett. Take a musical journey back to the days when words and melodies seemed simpler, and arrangements were wrapped in the sophistication of jazz. A cash bar and light fare are available for purchase at 5 p.m. This series is supported by Dane Arts with additional funds from Oak Park Place and Capitol Lakes. Madison Traffic Engineering installed its first visual electronic bicycle counter on Thursday, October 9th. The counter, called the Eco-Totem by manufacturer Eco-Counter, is located on the Southwest Path just east of Monroe Street. The counter tallies bicyclists that pass over loops embedded in the path. There are two counts displayed on the Eco-Totem. Near the top is the count for the day. Below this a thermometer type display that shows the number of bicyclists that have passed by cumulatively for the year. "We already count bicyclists at several locations in the city," said David Dryer, City Traffic Engineer. "The Eco-Totem will supplement our data collection program while also being visible to path users and drivers on the street--it will give people a reminder of how many bicyclists there are in Madison and the need to watch for cyclists on all City streets." The Southwest Path through the campus is area is one of the busiest paths in the city. Some of our newsletter articles get shared far beyond the neighborhood. Bill Hauda, President of Friends of the Badger Trail, shared four of the bicycle articles from the September 29, e-News with other FOBT board members. Here is his very complimentary e-mail to his fellow board members. 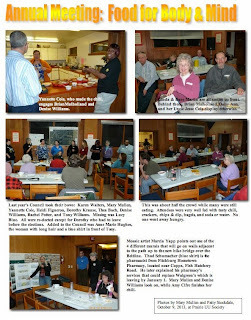 Thought you might be interested in the following from the Dunn's Marsh Neighborhood newsletter. Especially the item on the planned tunnel to carry Badger Trail users under busy County Highway PD (McKee Road). It will be a few years in the making, but the project is finally in the works. This was written by Mary Mullen, who does an excellent job editing this newsletter, which serves the area roughly north of PD, west of Seminole Highway, east of Verona Road and south of the Beltline. In this area of Fitchburg is the greatest confluence of bike paths, trails and MTB opportunities that exists in the state of Wisconsin, and Badger is one of them. 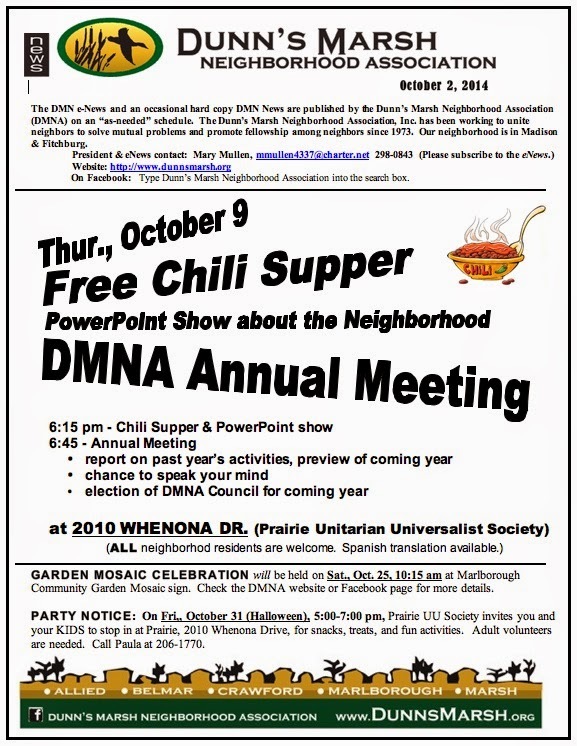 By the way, you can always see past newsletters on the http://dunnsmarsh.blogspot.com or access the blog through the DMNA website: www.dunnsmarsh.org <http://www.dunnsmarsh.org> home page. Another way to keep even more in touch is through the Dunn’s Marsh Neighborhood Association’s Facebook page. Photos are very much a part of most of these communications. Have you noticed a problem that the City of Madison might be able to fix if the city just knew about it? Once you are there, choose one of the many categories of “service.” In some cases, you will be referred to a number to call, but usually you just fill out the online form. Recently - October 21 - I reported that the street light on my corner is out. I expect it will be fixed in a day or two. Check for yourself how soon this gets done by driving to the corner of Whenona Drive/Milford Road. A service request order has been entered to repair this streetlight. I found out a few exceptions to the opportunity to fill out a form on the Report a Problem page. For dead deer, one needs to call the DNR at 266-2621. An abandoned vehicle on private property also requires a call - to Parking Enforcement, 266-0275. I found out a few exceptions to the opportunity to fill out a form. For dead deer, one needs to call the DNR at 266-2621. An abandoned vehicle on private property also requires a call - to Parking Enforcement, 266-0275. When filling out a report, often you have a choice of whether to give your own name and address, but sometimes your name and address is legally required. The city likes to have people give their name and address to cut down on false reports. Fitchburg has two ways to submit concerns. One is an all-purpose form while the other allows concerns to be submitted to a more specific agency in Fitchburg government. If you haven’t already created an account on the site, you’ll need to provide an e-mail address and password. Don’t be caught by surprise. Keep up with your city government by subscribing to notices online. Provide your e-mail address and then confirm it once you are sent an e-mail. There are many options to choose from. It all depends on what you are interested in. 6:45 or so - Meeting - Spanish translation will be available. ALL neighborhood residents are welcome. 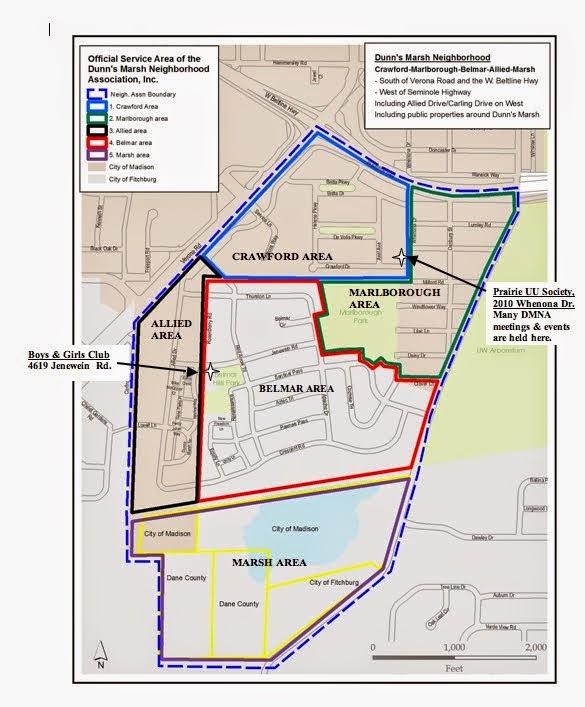 The Dunn’s Marsh Neighborhood is the area south of the Beltline/Verona Road between Seminole Highway and Allied/Carling Drives. It also includes Dunn’s Marsh and other public lands south of the Cannonball Trail. 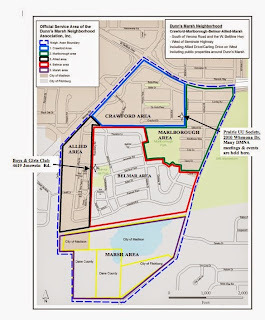 See the attached map of the neighborhood. On October 7, a little white female dog was lost in the Danbury/Sheffield area. She got out of the back yard and disappeared. 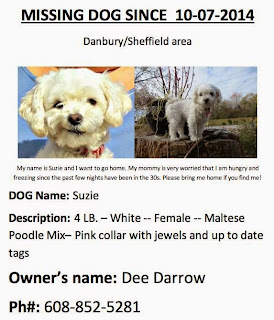 Her name is Suzie. 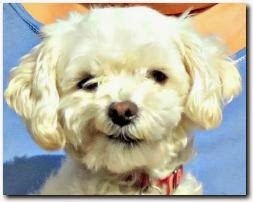 She is a a Maltese Poodle mix, very small at only 4 pounds, and was wearing a pink colar with jewels and up to date tags. If you have seen this dog, call Dee Darrow, (608) 852-5281.